This time it wasn’t the world’s finest sprinters, swimmers and javelin-throwers coming together, rather a select group of under-30s charged with no mean task: find solutions to the world’s most challenging problems.Earlier this week, South Africa’s largest city Johannesburg played host to the One Young World Summit 2013 which brought together more than 1,300 young leaders representing 190 countries. And they weren’t alone; a host of so-called ‘counsellors’ – including Kofi Annan, Sir Richard Branson, Sir Bob Geldof and Ahmed Kathrada – joined the throng to help inspire a new generation of leaders. Among the group of young leaders present – from the worlds of business, NGOs and government – was Billie-Rose Boorer, a schools project co-ordinator at the British and Irish TV and entertainment company, Sky. The company had an opportunity to send one delegate to the event. Head of Responsible Business,Daniella Vega afforded the opportunity to Billie in recognition of her work in supporting Sky’s hugely successful Sky Skills Studio – a project that helps young people develop life skills and learn about the world of work by using its state-of-the-art broadcast facility to make their own TV reports on a topic they’re studying at school. “The idea of the conference is to give future leaders a chance to meet, share ideas and start leading – so it was a great opportunity for me, at the beginning of my career, to take that first step and meet with like-minded people,” she tells me on a call from Johannesburg. 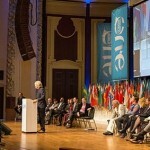 The like-minded people in the room, as well as the 100,000 people watching the summit online, were asked to focus on the six cross-cutting – demographically and geographically – areas of education; youth unemployment; global business; human rights; sustainable development; and leadership and government. Through a series of plenary speeches and working group sessions, the summit heard about the many great things that are already being done to tackle these challenges in a bid to inspire the young delegates on their return home to businesses and organisations the world over. And in contrast to the common, business-as-usual thinking among today’s corporate leaders, the message coming through loud and clear was: collaboration is good. “Daniella is often talking about the importance of collaborating,” says Billie. “And that was a real theme of the whole conference – cooperation and collaboration, in any of the six areas, is absolutely crucial if we are to make a real difference. And that’s exactly the point of gatherings of this nature. Yes, it’s a big talking shop; a chance for the likes of Geldof and Branson to grab some headlines. But it’s also about inspiring a new generation to take nuggets of what they’ve seen and heard and feed it back into their own workplaces. Billie, for example, will report back to her team, telling them of her experience and what she’ll be doing to bring what’s she learned into her work at Sky. And the other 1,299 will no doubt be doing the same. As Billie says, “it’s an overwhelming experience meeting so many different people from across the world”. “We were a diverse group, but we’re all tackling the same problems. When we are all back home, spread across the world, our messages will be multiplied and a lot of good will come out of it,” she adds. But what of the burden of the onus that is so often placed on young people? Isn’t it too much to ask the next generation to solve these common challenges, especially, as Annan says, the under-30s have little say in the decisions being made that affect their lives so immensely? According to Billie, while some of the event’s counsellors took the it-is-up-to-the-new-generation-to-take-a-lead line, others are more realistic about how today’s problems are best overcome. “I like the approach that says that, actually, current business and world leaders are still leading and we’re in this together,” she says. But despite the challenges that remain – not least the fact that 57 million children around the world are not in school – Billie left Johannesburg feeling optimistic about her generation’s ability to solve problems and make the world a better place. “Being in that room was empowering; everyone was present because they have a personal interest in fixing these problems. For more on ‘Seeing the Bigger Picture at Sky’, click here. To learn more about the Sky Skills Studio, click here.